I've heard it said (maybe by me - I can't remember!) that in Varanasi you find what you're looking for. More specifically, we bring our energies and hopes and fears there, and they are reflected back to us like looking in a mirror. If you're feeling fearful, you'll find much to fear. But if you're feeling open and loving, you'll be swimming in a sea of love. I heard a story about a woman who has particularly freaked out by the cows that inhabit all parts of the city - they wander through traffic, and meander through the narrow stone lanes that are only a few feet wide in places. She was especially grossed out by the cowshit that seems to be found near cows, and one day got stuck right behind a cow who unloaded on her - a shotgun blast of cow poopage right to the chest. Part of me doesn't want to laugh, but the rest of me does. Is it a coincidence that the paranoid one gets a chest-full, and not someone else? Somehow I don't think so. I was only planning a short trip to Varanasi this year, so I didn't think she'd have the chance to grab me by my ankles and throw me around like a rag doll. But she must have gotten wind of my schedule, cuz I still got twisted and stretched to the breaking point. As usual. The beginning of another leper-beggar-family-reunion-lovefest started when I saw Anita on the ghats (stone steps) leading down to the Ganges. I met some lepers I hadn't seen for a long time, and some of the street kids I hadn't seen for five years. I went with Anita to see some of her five children who were sleeping in the abandoned building I've written about in the past, open on all sides and surrounded by garbage. To call it living in squalor doesn't quite paint it desperately enough. It looks like maybe 30-40 people are living in this area, which is about 30x40 feet, depending on how far into the garbage dump you go before you stop measuring. Many of the people I photographed living there last year are still there (and were thrilled to have the photos.) Food is cooked on open fires - which is the genesis of this story. 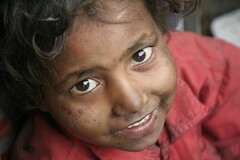 I happened to notice a mother and her little girl, Poonita, who is four or five. She had massive burns on her right arm, from her upper bicep all the way down to her fingers. She was holding her arm gingerly, and wouldn't bend it, even a little. The mother said she'd fallen into the fire about a month before, and she'd just gone to the doctor three days earlier for the first time. 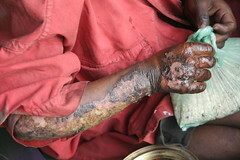 Great pieces of burned skin were still hanging off the arm, and it was badly infected. It looked like it would eventually heal, but without intervention it would heal with her arm frozen in place, probably for life. 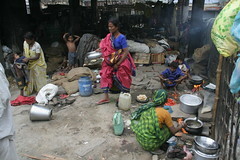 Against my own better judgment, I offered to take Poonita to the hospital, along with her mother, and Anita to translate. I only had two days left in Varanasi, so I doubted that much could be done, but it seemed worth trying. The next morning, the start of a Full Day, we all went to the local hospital. To my great delight, I was able to get the hospital to agree to 30 days of daily physical therapy, which I paid the hospital for directly (it cost $20.) Thrilled! And then I witnessed the first physio treatment - Not Thrilled! The doctor was on vacation, but the nurse seemed confident, if not competent, as she pulled out the ultrasound machine (I have no idea why it was called for.) Poonita's discomfort started slowly and grew, as did her moans, which turned into cries, which turned into screaming at the top of her lungs. After the ultrasound, the nurse started stretching Poonita's arm, which is where Poonita (and I) really started going downhill. This poor child didn't have any anesthetic, or even aspirin, and hadn't moved her arm more than a few degrees in a month. Now the nurse was stretching her arm, slowly but steadily, until it was completely straight. The shrieks resonated in the tile room and filled the hospital, and it was just about more than I could bear. At that moment, I wasn't just witnessing Poonita's pain, as bad as it was, but she represented to me all the suffering of all the impoverished everywhere - all the suffering in the world. It was just too much. I felt genuine joy in helping this child, but was torn between crying for happiness and just breaking down over the enormity of it. After the treatment, I stressed to Anita, who is just a neighbor of Poonita, that they needed to come every day to the hospital, and asked her if she would help make that happen. She said, "Of course. This baby same my baby." Just beautiful - and made me want to cry again. Anita and the mother were quite stoic (unlike me!) during the ordeal, but I sensed that we were all shaken by it. I didn't have any confidence that they'd go back for even one more treatment. But I had tried. Too add more unreality to my unreality, my friend and I went to a five-star hotel for dinner that night. There was beautiful live Indian classical music, and the gourmet food was served out of shining silver bowls. The contrast with the homeless hovel was disorienting, and I just shook my head in wonder. A few hours after getting back to our hotel, we both got Delhi Belly, thereby completing that much sought-after Traveler's Trifecta: Drama, Decadence, and Diarrhea, all in a 24 hour period. Now that's a good day! and not be overwhelmed by the enormity of it. And yet another girl who lives in the abandoned building. I really love this kid!